If you tuned into Who Do You Think You Are? last Friday night, you watched Vanessa Williams discover some surprising family history within her great-great grandfather’s Civil War pension file. Her ancestor, David Carll, a black man from Oyster Bay, NY, was a private in Company I, 26th Infantry, U.S. Colored Troops (U.S.C.T. ), in the final years of the Civil War. Checking his service record on Footnote, we learn that he served on General Jackson’s boat crew and was stationed in Beaufort, South Carolina, spending much of his service on duty in the hospital there. The service record is like an outline of a soldier’s time in the army, while a pension file will reveal much more, as Vanessa found out. 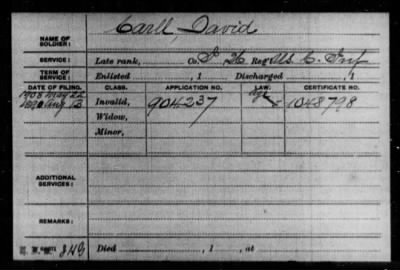 Locating David Carll’s name in the Civil War and Later Veteran Pensions Index reveals that he filed his application for a pension on August 13, 1890. The certificate number on the index card – 1,048,798 – identifies the file, which is available at the National Archives in Washington, DC. It is there that Vanessa Williams and the NARA researcher assisting her reviewed the documents. One of the most significant items in his file was a tintype of David Carll, a very unusual and surprising discovery! You, too, can find your Civil War ancestors by exploring Footnote’s unique historical records. Begin your search in the Footnote.com Civil War Collection, make connections, and follow the leads to discover rewarding surprises in your own family history. My question is, Are the documents on Footnote.com for David Carll as complete as what was available at NARA? I have heard from others that the Footnote records do not have everything — can you speak to the veracity of this? I have found records for my Civil War ancestors on Footnote — is there anything to be gained by sending away for a copy of the file? Sometimes the soldier’s service files they show on this show do seem very detailed. I have seen a folded card file that has a summary of their time in the service. I’ve never seen this in the scanned documents. However, I found it interesting in this episode with Vanessa Williams, they did not even mention what the NARA cards stated about her ancestor’s service in a hospital. JoAnn, most service records contain more than one card, so it’s possible that David Carll may have additional cards at NARA. However, the service records for his regiment are considered to be complete. Civil War pension files are not available online. If you find someone in the index, it is a very good idea to write to NARA for a copy of the complete file. The index simply tells you that a pension file is available. The contents of the file itself can be prolific and enlightening. Good luck with it! I want to follow up on my previous comment regarding Civil War pension files. Those files can be ordered from NARA, and that’s where you’ll find most soldiers’ pensions. Civil War Widows’ pension files, however, have been available on Footnote for over two years through a digital partnership between NARA, Footnote, and FamilySearch. There are already over one million images available, representing thousands of digital files and pensioners.